Justification: Athenian archon Charikleides (lines 2 and 56). Athens . Found to the southwest of the Hephaisteion, where it was reused to cover a Hellenistic cistern. Lambert suggests that it was originally displayed in the Eurysakeion, located nearby (see line 11). Now in the Stoa of Attalos (inv. no. I 3244). Intriguingly, however, the document itself claims to have been set up in the sanctuary of Athena Skiras, cf. lines 50-52. Intact stele of white marble, with a pediment at the top and a tenon for insertion into a base at the bottom. Roughly dressed at the back. See Lambert for further details. Line 1 is a header inscribed on the pediment of the stele. Lines 2-68: Stoichedon 38. Lines 69-79: quasi-stoichedon. Lines 80-97: not stoichedon. Letters: 6 mm high on average. Edition here based Lambert 1997: 85-93 no. 1. Note that we do not underdot letters that were previously read confidently by Ferguson. Cf. also: SEG 21, 527; Sokolowski LSS 19; Rhodes - Osborne GHI 37; AIO , with another English translation and commentary. Further bibliography: Mikalson 1975; Kearns 1989: 35; Van Straten 1995; Parker 1996; Ekroth 2002: 134; Pirenne-Delforge 2004; Brun 2005: no. 141, with French translation and commentary; Parker 2005a; Georgoudi 2016.
δῶνι Ἱπποδρομίωι ὗν∶ ΔΔΔΔ, ἥρωι Φαίακι χοῖρ⟨ο⟩ν 𐅂𐅂𐅂ΙΙΙ, ἥρωι Τεύκρωι χοῖρον 𐅂𐅂𐅂ΙΙΙ, ἥρωι Ναυσείρωι χοῖρον 𐅂𐅂𐅂ΙΙ[Ι]. ξύλα ἐφ’ ἱεροῖς καὶ τἄλλα 𐅂𐅂𐅂 . Μαιμακτηριῶνος· Ἀθηνᾶι Σκιράδι οἶν ἐνκύμονα Δ𐅂𐅂, Σκίρωι οἶν Δ𐅃, ξύλα ἐπὶ τὸν βωμὸν 𐅂𐅂[𐅂]. Gods. In the archonship of Charikleides at Athens. On the following terms the arbitrators reconciled the Salaminioi of the Seven Tribes and the Salaminioi from Sounion, (5) both parties agreeing with each other that the terms proposed by the arbitrators were good, Stephanos of Myrrhinous, Kleagoros of Acharnai, Aristogeiton of Myrrhinous, Euthykritos of Lamptrai, Kephisodotos of Aithalidai. The priesthoods shall be common to both parties for all time: (10) that of Athena Skiras, that of Heracles at Porthmos, that of Eurysakes, that of Aglauros and Pandrosos, and of Kourotrophos. Appointment shall be by lot jointly from both parties when one of the priestesses or priests dies, and those who obtain the office by lot (15) shall serve as priests on the same terms as the previous priests. The land at the Herakleion at Porthmos and the salt-works and the agora at Koile shall be divided into two equal parts for each party; and each party shall set up boundary markers on its own part. They shall sacrifice to the gods and heroes (20) according to the following terms. Everything which the city provides at public expense, or which the Salaminioi happen to receive from the oschophoroi or from the deipnophoroi, both parties shall sacrifice jointly and divide the raw meat, half for each party. Everything which the Salaminioi used to sacrifice from the rents (25) they shall sacrifice from their own resources according to the ancestral customs, each party contributing half for all the sacrifices. To the priests and priestesses shall be given the perquisites prescribed here. To the priest of Heracles, as priestly dues, 30 drachmae; for pelanos (30) 3 dr.; each party shall contribute half of these sums. Of the sacrificial animals which he sacrifices for the whole group he shall take the skin and the leg of an animal that has been flayed, the leg of an animal that has been singed; of an ox he shall take nine pieces of flesh and the skin. To the priest of Eurysakes, as priestly dues, 6 dr.; (35) for pelanos for both cults 7 dr.; in lieu of the leg and skin in the Eurysakeion, 13 dr.; each party shall contribute half of these sums. Of the sacrificial animals sacrificed to the hero at the salt-works he shall take the skin and the leg. To the priests and (40) priestesses in the sanctuaries where each is priest a portion shall be distributed from each party. The loaves from Skiras shall be distributed in the following way, having removed from the total those which it is ancestral custom to remove: for the herald a loaf, for the priestess of Athena a loaf, for the priest of Heracles a loaf, (45) for the priestess of Pandrosos and Aglauros a loaf, of Kourotrophos and for the basket-bearer (or: for the basket-bearer of Kourotrophos) a loaf, for the kopai a loaf; of the rest each party shall have a half share. An archon shall be chosen by lot from each party in turn to appoint the oschophoroi and deipnophoroi together with the (50) priestess and the herald according to the ancestral custom. Both parties shall write these things up on a common stele and stand it in the sanctuary of Athena Skiras. The same man shall be priest for Eurysakes and for the hero at the salt-works. If there is any need to do building works in the sanctuaries, (55) they shall do it jointly, each party contributing half the costs. In the archonship of Charikleides, the Salaminioi of the Seven Tribes provided the archon. All the written records shall be common to both parties. The lessee shall work the land until the time (60) for which he leased the land expires, paying half the rent to each party. The preliminary sacrifice before the contest each party shall undertake in turn. Each party shall take half of the meat and skins. The priestly dues of the herald shall belong to Thrasykles according to (65) ancestral custom. All other claims, whether against individuals or groups, up to the month of Boedromion in the archonship of Charikleides, shall be dropped. one line uninscribed. In the archonship for the Salaminioi of Diphilos son of Diopeithes of Sounion, (70) the following of the Salaminioi from Sounion swore oaths: Diopeithes son of Phasyrkides, Philoneos son of Ameinonikos, Chalkideus son of Andromenes, Chariades son of Charikles, Theophanes son of Zophanes, Hegias son of Hegesias, Ameinias son of Philinos. In the archonship for the Salaminioi of Antisthenes son of Antigenes of Acharnai, (75) the following took the oath from the Seven Tribes: Thrasykles son of Thrason of Boutadai, Stratophon son of Straton of Agryle, Melittios son of Exekestides of Boutadai, Aristarchos son of Demokles of Acharnai, Arkeon son of Eumelides of Acharnai, Chairestratos son of Pankleides of Epikephisia, Demon son of Demaretos of Agryle. (80) Archeneos proposed: in order that the Salaminioi may always make the sacrifices to the gods and heroes according to ancestral custom and that the terms on which the conciliators reconciled both parties and to which those elected swore oaths shall be put into effect, the Salaminioi have decreed that the archon Aristarchos shall inscribe all the sacrifices and the prices of the sacrificial animals on the stele on which the terms of the settlement are, in order that the archons from both parties at any time in the future may know what amount of money each party has to contribute for all the sacrifices from the rent of the land at the Herakleion, and to stand the stele in the (85) Eurysakeion. In Mounychion: at Porthmos, for Kourotrophos a goat, 10 dr.; for Iolaos a male sheep burnt whole, 15 dr.; for Alkmene an ewe, 12 dr.; for Maia an ewe, 12 dr.; for Heracles an ox, 70 dr.; for the hero at the salt-works a male sheep, 15 dr.; for the hero at Antisara a piglet, 3 dr. 3 ob. ; for the hero Epipyrgidios a piglet, 3 dr. 3 ob. ; to sacrifice a male sheep for Ion every other year; wood for the sacrifices, including those for which the city gives money according to the kyrbeis, 10 dr.; on the 18th for Eurysakes a pig, 40 dr.; wood for the sacrifices and for other things, 3 dr. In Hekatombaion: at the Panathenaia, for Athena a pig, 40 dr.; wood for the sacrifices and for other things, 3 dr. In Metageitnion: on the 7th for Apollo Patroios a pig, 40 dr.; for Leto a piglet, (90) 3 dr. 3 ob. ; for Artemis a piglet, 3 dr. 3 ob. ; for Athena Agelaa a piglet, 3 dr. 3 ob. ; wood for the sacrifices and for other things, 3 dr. 3 ob. In Boedromion: for Poseidon Hippodromios a pig, 40 dr.; for the hero Phaiax a piglet, 3 dr. 3 ob. ; for the hero Teukros a piglet, 3 dr. 3 ob. ; for the hero Nausiros a piglet, 3 dr. 3 ob. ; wood for the sacrifices and other things, 3 dr. 3 ob. In Pyanopsion: on the 6th for Theseus a pig, 40 dr.; for other things, 3 dr.; at the Apatouria for Zeus Phratrios a pig, 40 dr.; wood for the sacrifices and other things, 3 dr. In Maimakterion: for Athena Skiras a pregnant ewe, 12 dr.; for Skiros a male sheep, 15 dr.; wood for the altar, 3 dr.
Total that it is necessary for both parties to spend on all the sacrifices, 530 dr. 3 ob. They shall sacrifice these jointly from the rents of the land at the Herakleion (95) at Sounion, each party contributing money for all the sacrifices. If anyone makes, or if any archon puts to the vote, a proposal to rescind any of these terms or diverts the money elsewhere, he shall be accountable to the whole genos and the priests on the same basis, and also privately liable to legal action by any of the Salaminioi who wishes. Dieux. Sous l’archontat de Charikleidès chez les Athéniens, les arbitres ont rendu leur jugement dans les termes suivants, dans le conflit entre les Salaminiens des sept tribus et les Salaminiens de Sounion, (5) chacune des deux parties ayant accepté les conclusions prononcées par les arbitres Stephanos de Myrrhinonte, Kleagoros d’Acharnes, Aristogeiton de Myrrhinonte, Euthykritos de Lamptrai, Kephisodotos d’Aithalidai. Que les prêtrises soient pour toujours communes aux deux parties, (10) c’est-à-dire celles d’Athéna Skiras, d’Héraclès à Porthmos, d’Eurysakès, d’Aglauros, de Pandrosos et de Kourotrophos; quand une prêtresse ou un prêtre décèdera, que l’on procède par tirage au sort parmi les deux groupes. Que ceux qui seront choisis par le sort (15) exercent leur prêtrise dans les mêmes conditions que leurs prédécesseurs. Que l’on partage la terre de l’Herakleion à Porthmos, la saline et l’agora de Koilè en deux parts égales pour chacune des parties et que chaque partie dresse des bornes pour délimiter sa propre part. Que l’on sacrifie aux dieux et aux héros (20) de la façon suivante : tous (les animaux) que la cité fournit sur les fonds publics ou ceux qui sont reçus par les Salaminiens de la part des Oschophores ou des Deipnophores, que les deux groupes les sacrifient ensemble et se partagent par moitié les viandes crues. Mais tous les (animaux) que les Salaminiens sacrifiaient grâce aux revenus du loyer, (25) qu’ils les sacrifient avec leurs propres ressources selon les coutumes ancestrales, chacun contribuant pour moitié à tous les sacrifices. Que l’on donne les parts d’honneur aux prêtres et aux prêtresses selon ces dispositions : au prêtre d’Héraclès, en guise de rémunération, 30 drachmes; pour le pelanos, (30) 3 dr. Que chaque groupe y contribue pour moitié. Des animaux sacrificiels communs qu’il sacrifie, qu’il reçoive la peau et la patte des animaux écorchés, la patte des animaux dont la peau a été roussie; d’un bovin, qu’il reçoive neuf parts de viande et la peau. Au prêtre d’Eurysakès, en guise de rémunération, 6 dr.; (35) pour le pelanos, 7 dr. pour les deux cultes; au lieu de la patte et de la peau dans l’Eurysakeion, 13 dr. Que chaque groupe y contribue pour moitié. Des animaux sacrificiels au héros de la saline, qu’il reçoive la peau et la patte. Que chaque groupe donne leur part aux prêtres et (40) aux prêtresses dans les sanctuaires où ils officient. Qu’ils distribuent les pains du sanctuaire de Skiras de la manière suivante, une fois qu’auront été prélevés de l’ensemble ceux qui doivent l’être selon les coutumes ancestrales : au héraut, un pain; à la prêtresse d’Athéna, un pain; au prêtre d’Héraclès, un pain; (45) à la prêtresse de Pandrosos et d’Aglauros, un pain; à celle de Kourotrophos et à la porteuse de corbeille (ou : à la porteuse de corbeille de Kourotrophos), un pain; aux kopai, un pain. Que le restant soit équitablement réparti entre les deux groupes. Que l’archonte soit alternativement tiré au sort dans chaque groupe et désigne, avec la prêtresse (50) et le héraut, les Oschophores et les Deipnophores, selon les coutumes ancestrales. Que ces dispositions soient retranscrites par les deux groupes sur une stèle commune et qu’elle soit dressée dans le sanctuaire d’Athéna Skiras. Que le même homme occupe les fonctions de prêtre d’Eurysakès et du héros de la saline. S’il est nécessaire d’entreprendre des réparations dans les sanctuaires, (55) qu’elles soient faites en commun et que chaque groupe y contribue pour moitié. Sous l’archontat de Charikleidès, les Salaminiens des sept tribus ont fourni l’archonte. Que toutes les archives soient communes aux deux groupes. Que le locataire de la terre la travaille jusqu’au terme (60) de son bail et verse à chaque groupe la moitié du loyer. Que chacun fasse à tour de rôle les sacrifices préliminaires au concours et prélève la moitié des viandes et des peaux. Que la charge sacrée de héraut revienne à Thrasyklès, selon (65) les coutumes ancestrales. Quant aux autres poursuites, d’ordre privé ou d’ordre public, engagées jusqu’au mois de Boedromion de l’archontat de Charikleidès, qu’elles soient abandonnées. Sous l’archontat, chez les Salaminiens, de Diphilos fils de Diopeithès de Sounion, (70) ont prêté serment parmi les Salaminiens de Sounion : Diopeithès fils de Phasyrkidès, Philoneos fils d’Ameinonikos, Chalkideus fils d’Andromenès, Chariadès fils de Chariklès, Theophanès fils de Zophanès, Hegias fils d’Hegesias, Ameinias fils de Philinos. Sous l’archontat, chez les Salaminiens, d’Antisthenès fils d’Antigenès d’Acharnes, (75) ont prêté serment parmi les Salaminiens des sept tribus : Thrasyklès fils de Thrason de Boutadai, Stratophon fils de Straton d’Agrylè, Melittios fils d’Exekestidès de Boutadai, Aristarchos fils de Demoklès d’Acharnes, Arkeon fils d’Eumelidès d’Acharnes, Chairestratos fils de Pankleidès d’Epikephisia, Demon fils de Demaretos d’Agrylè. (80) Archeneos a proposé. Afin que les Salaminiens puissent à l'avenir faire les sacrifices aux dieux et aux héros selon les coutumes ancestrales et que tout s’accomplisse selon les clauses que les arbitres ont prononcées pour les deux groupes et qu’ont jurées ceux qui ont été désignés, qu’il plaise aux Salaminiens de décréter que l’archonte Aristarchos fasse retranscrire sur la stèle qui porte les arbitrages l’ensemble des sacrifices et des prix des animaux sacrificiels, afin que les archontes issus des deux groupes en charge sachent le montant que devront verser les deux groupes pour tous les sacrifices, argent issu de la ferme de la terre de l’Herakleion, et qu’il fasse dresser la stèle dans (85) l’Eurysakeion. En Mounichion : à Porthmos, pour Kourotrophos, un caprin, 10 dr.; pour Iolaos, un mouton brûlé entièrement, 15 dr.; pour Alcmène, une brebis, 12 dr.; pour Maia, une brebis, 12 dr.; pour Héraclès, un bovin, 70 dr.; pour le héros de la saline, un mouton mâle, 15 dr.; pour le héros à Antisara, un porcelet, 3 dr. et 3 oboles; pour le héros Epipyrgidios, un porcelet, 3 dr. et 3 oboles; pour Ion, que l’on sacrifie un mouton mâle une année sur deux. Bois pour les sacrifices et ceux que donne la cité conformément aux kyrbeis, 10 dr. Le 18, pour Eurysakès, un porc, 40 dr. Bois pour les sacrifices et autres fournitures, 3 dr. En Hekatombaion, lors des Panathénées, pour Athéna, un porc, 40 dr. Bois pour les sacrifices et autres fournitures, 3 dr. En Metageitnion : le 7, pour Apollon Patroios, un porc, 40 dr.; pour Leto, un porcelet, (90) 3 dr. et 3 oboles; pour Artémis, un porcelet, 3 dr. et 3 oboles; pour Athéna Agelaa, un porcelet, 3 dr. et 3 oboles. Bois pour les sacrifices et autres fournitures, 3 dr. et 3 oboles. En Boedromion, pour Poséidon Hippodromios, un porc, 40 dr.; pour le héros Phaiax, un porcelet, 3 dr. et 3 oboles; pour le héros Teukros, un porcelet, 3 dr. et 3 oboles; pour le héros Nauseiros, un porcelet, 3 dr. et 3 oboles. Bois pour les sacrifices et autres fournitures, 3 dr. et 3 oboles. En Pyanopsion : le 6, pour Thésée, un porc, 40 dr.; autres fournitures, 3 dr.; lors des Apatouries, pour Zeus Phratrios, un porc, 40 dr. Bois pour les sacrifices et autres fournitures, 3 dr. En Maimaktêrion, pour Athéna Skiras, une brebis pleine, 12 dr.; pour Skiros, un mouton mâle, 15 dr. Bois pour l’autel, 3 dr.
Total de la somme que les deux groupes devront verser pour l’ensemble des sacrifices : 530 dr. et 3 oboles (ou 533 dr. ?). Que ces sacrifices soient communs et payés par les deux groupes sur l’argent issu de la ferme du loyer de la terre de l’Herakleion (95) à Sounion. Si quelqu’un propose ou si un archonte met aux voix une proposition visant à abolir l’une de ces dispositions ou répartit autrement l’argent, qu’il soit passible d’une mise en examen de la part de l’ensemble du genos et des prêtres de la même manière, et aux termes d’une action privée, de poursuites par tout Salaminien qui le voudra. This dossier of documents stems from the mutual agreement of two apparently distinct and disputing parties within the genos of the Salaminioi. The inscription, together with a later arbitration (Ferguson, p. 9-12 no. 2, 265/4 BC, found on the Kolonos Agoraios; cf. Lambert, no. 2) and a honorary decree (IG II² 1232) , make this one of the best attested gene in Attica or even in the Greek world (for other inscriptions that have a possible connection to the Salaminioi, cf. Lambert, p. 104-106). At some juncture, though the reasons for this are far from clear, the Salaminioi had apparently become divided into two groups: one, "of the seven tribes", τῶν ἑπτὰ φυλῶν (or: Ἑπταφυλῶν); the other, from Sounion in southern Attica. Each group possessed its own organisation (e.g. eponymous archons, cf. lines 56-57, 69-79), but the two clearly shared property (the Herakleion at Porthmos, the salt-works, the agora of Koile) as well as a variety of cults. The present agreement unified (or reunified) the genos (note that they are only called "Salaminioi" in the decision to inscribe their sacrificial calendar, line 80). Ferguson suggested that the Hepta Phylai are the seven Kleisthenic tribes to which the non-Sounian members belonged (this is cautiously accepted by Lambert, and Osborne; a different view would postulate a connection with Salamis itself, see Parker 1996: 312 who suggests an archaic Salaminian organization). On the origins of the Salaminioi, see further Arist. Pol. 1252b 17-18, with further discussion in Lambert, p. 94-103. The diverse property and apparently flexible topographic situation of the group included three key sites, which match the major cults of the genos: the temple of Athena Skiras at the port of Phaleron; the sanctuary of Heracles at Porthmos (probably near Sounion, and so too perhaps the salt-works); and the Eurysakeion at Kolonos Agoraios, near the demes of Koile and Melite, close to the center of Athens and the Agora. For all of these and other locations, see further below ad loc. Completely preserved on the stele, the inscribed dossier is divided into two major parts: first, the decree of the Salaminioi, recording their acts of reconciliation and decision to rent out lands (lines 1-79), which was to be set up in the temple of Athena Skiras; second, the sacrificial calendar of the group (which also provides an accounting of the expenses for the shared cults; lines 80-97), which was to be set up in the Eurysakeion. For other dossiers belonging to gene as well as to other subcivic groups in Attica, and which typically included sacrificial calendars, see here e.g. CGRN 19 (deme of Skambonidai), CGRN 24 (genos of the Praxiergidai), CGRN 25 (deme of Paiania), or CGRN 26 (a trittys?). The first part of the dossier, the agreement (διαλλαγή), clearly derives from a procedure of arbitration between the two branches of the genos, with representatives from various demes having served as arbitors (lines 1-8). As Osborne points out (p. 190), five arbitrators is rather a sizable number, testifying to the complexity and perceived importance of these decisions. Throughout the agreement which follows, emphasis is repeatedly placed on the equitable sharing for all duties and privileges for both parties, and the "even split" of the financing for the rites shared by both groups of Salaminioi (the terminology of ἀμφότερος, ἕκατερος, ἥμισυς, etc, is conspicuously present throughout this first part of the inscription). Both sides thereby agreed to share equitably certain priestly offices (lines 8-16), to mark the division of sacred shared property with boundary stones (lines 16-20) and to share the costs and benefits of sacrifices financed by the polis and sacrifices paid for by the genos (lines 19-27). The remainder of the decree is specifically devoted to outlining aspects of the cults of the genos. Subjects treated as part of this agreement include the remuneration of priests (lines 27-50) and the maintenance of sanctuaries (cf. lines 55-57), among still further subjects. The agreement is followed by a short supplementary decree, when the Hepta Phylai had the eponymy, in lines 56-67, discussing among other matters the conservation of archives for the genos (lines 57-58), as well as the financing of common cults through the renting of such properties (alluded to in lines 24, and more explicitly defined in lines 58-61). And another pair of documents follows, lists containing the names of people who took an oath to abide by the present agreement, of oath-takers from both groups of Salaminioi respectively (in lines 69-79). The raison d'être of the second part of the dossier, essentially a sacrificial calendar for the unified group, is quite clear: a precise accounting of the expenses for each sacrifice must made, so that the annual archons may keep a balanced budget and use the funds derived from the rental of the Herakleion (lines 80-85). The order of the calendar is: Mounychion first (month 10 in Athens), then a more standard Athenian sequence: Hekatombaion – Metageitnion – Boedromion – Pyanopsion – Maimakterion (months 1 to 5 of the year in Athens). The periods Posideon – Elaphebolion (months 6-9) and Thargelion – Skirophorion (months 11-12) are not mentioned in the calendar, demonstrating the specificity of the rites of the group. Rituals only took place on half of the months in the year and seemingly only on very specific days or occasions. It would thus appear that the calendar of the genos began at a different juncture than the usual year in Athens (where Hekatombaion was month 1), though it otherwise followed the expected order of the months. For the starting months of the calendars of subcivic groups being different from the official calendar of the city, cp. esp. here CGRN 21 (perhaps also a calendar of a genos). As in other 4th century BC calendars from Attica, the prices for sacrificials animals are standardised in the accounting presented here: 70 drachmae for an ox (perhaps a castrated male); 40 dr. for a (probably male) pig; 15 dr. for a male sheep and 12 dr. for a female sheep; 10 dr. for a goat; 3 dr. and 3 obols for a piglet; cp. here esp. CGRN 52 (Erchia) and CGRN 56 (Marathonian Tetrapolis), with slight differences (e.g. for piglets) and further discussion. The total expenditure of the genos on its annual rites, including supplies of wood for the sacrifices which are also accounted for here, totalled 530 dr. and 3 obols (or 533 dr. depending on the reading; both are possible according to Lambert); in other words, approximately the same as the annual rites for the whole deme of Erchia (though Erchia sacrificed 56 animals in one year, compared to 22-23 for the Salaminioi). Lines 6-16: This section concerns the attribution of the priesthoods of the genos: the agreement resolves that all of the major priesthoods are to be shared among the two constituent groups. Tenure was for life. Whenever one of the priests or priestesses died, a new official is to be appointed by lot from among all the constituents. On appointment through sortition in Attica, cp. here CGRN 43, lines 17-23 (with commentary). The major priesthoods of the group were four or five in number. Athena Skiras, Heracles at Porthmos and Eurysakes each had their own priest. From the syntax in lines 11-12, it is not clear whether there is a joint priesthood of Aglauros, Pandrosos and Kourotrophos, or if Kourotrophos has her own priestess. 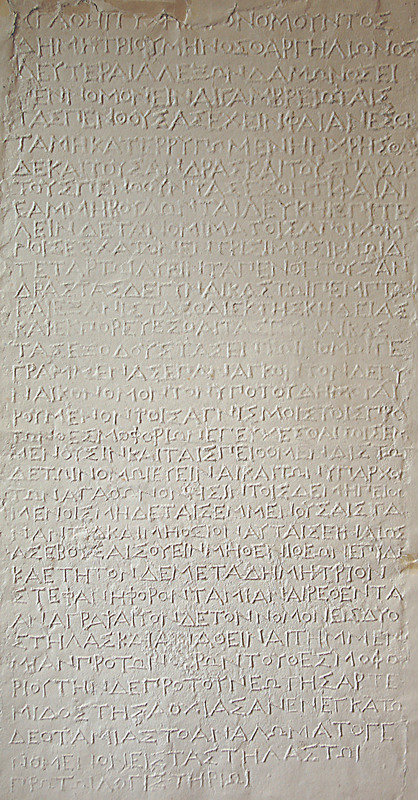 Lines 45-46 of the inscription (Πανδρόσο καὶ Ἀγλαύρο ἱερείαι ἄρτον, Κοροτρόφο καὶ καλαθηφόρωι ἄρτον) might be taken to mean that Kourotrophos had her own priestess, since a bread as a perquisite is given "to the priestess of Aglauros and Pandrosos, and a bread to (that of) Kourotrophos and the basket-bearer"; but the second part of the line may also be read as "... and a bread to the basket-bearer of Kourotrophos". In other inscriptions, Aglauros, Pandrosos and Kourotrophos each have separate priests (cf. the discussion in Parker 1996: 311). On Kourotrophos, see Pirenne-Delforge. The sanctuary of Athena Skiras was situated in Phaleron: cf. Paus. 1.1.4; Str. 9.1.3; IG II² 1232. Intriguingly, however, Skira was also another name for Salamis (cf. Lambert; Rhodes - Osborne), Hdt. 8.94.2 mentions a cult of Athena Skiras at Salamis, and Skiros was a primeval king of the island (Parker 1996: 313). These are clues that may begin to explain the importance of the cult for the group of the Salaminioi and their right to control its priesthood. For Aglauros cp. here CGRN 32 (Thorikos), line 53-54 (partly restored); and CGRN 52 (Erchia), col. Α, lines 58-66 + col. Β, lines 56-60 + col. Γ, lines 60-65 + col. Δ, lines 57-61; Pandrosos is restored in col. Ε, lines 66-67 in the latter. It remains to a degree unclear why the Salaminioi held this priesthood, since rites in connection with these goddesses are not mentioned in the regulation that follow. As for the Eurysakeion, the sanctuary of the Athenian hero Eurysakes, it appears to have been of central importance to the group and was located near the center of the city; it stood above the Kolonos Agoraios, cf. Philochoros FGrH 328 F 26. Lines 16-19: The sanctuary of Heracles at Porthmos, perhaps near Sounion, and its landed property was apparently in the control of both factions of the group and thus formed one of its main assets. The others included a salt-works (ἁλή) as well an agora (marketplace) at Koile. The deme of Koile was a neighbour of the deme of Melite, where the Eurysakeion itself was located. Lines 19-27: This section of the agreement defines several binding rules concerning sacrifices. Whenever the city provides and pays for sacrifices that the Salaminioi were to organize, the two groups making up the Salaminioi share the sacrificial responsibilities, and meat from the sacrifices in such cases is to be shared equitably. The same is to apply to any supplies given by the ὀσχοφόροι and the δειπνοφόροι. The sacrifices funded by the Salaminioi themselves are to be paid for by the two groups half-half, with money from the renting of land. The festival alluded to here was the Oschophoria, a public festival held in Pyanopsion, though it remains imprecisely dated (see Mikalson, p. 67-69, and also below on lines 92-93). The festival was in honour of Athena and Dionysus, and related to the myth of Theseus' return from Crete (Plut. Theseus 23.2-5, see also below for further mentions of Theseus and his mythical connection to the Salaminioi). Specifically, the celebration seems to have involved a procession from the temple of Dionysus in Athens to the sanctuary of Athena Skiras in Phaleron. According to the accounts of the sources, one or two cross-dressed boys here carried vine-plants loaded with grapes (called the ὀσχοφόροι); contests and other celebrations for youths were also apparently held at this time. The δειπνοφόροι were female meal-carriers (probably the mothers?) of the young boys involved in the procession and the cult. For an extensive discussion, with all of the sources, see Parker 2005a: 211-217 and 477. Cf. also lines 47-50 of this inscription for further regulations concerning the ὀσχοφόροι and δειπνοφόροι. Lines 27-33: This part of the regulations begins to set out the sums due to the priestly personnel of the Salaminioi, and principally two male priests. For priestly remuneration in Attica, see esp. here CGRN 57 (Aixone). The term "prescribed perquisites" (τὰ γέρα τὰ γεγραμμένα) seems to refer to the rules laid down presently (we might have expected the term πρo-γεγραμμένα otherwise). First and foremost is the priest of Heracles (at Porthmos, see above, lines 16-19). This priest receives a sizeable amount as ἱερεώσυνη, a priestly prerogative that takes the form of a sum of money, namely 30 dr. This amount may have served to compensate the priest for incidental expenses, i.e. to buy provisions, during the performance of the cult, though a separate amount of money is already set aside for buying wood for the main sacrifices of the Herakleia in Mounichion (lines 87-88). Furthermore, a sum of 3 dr. was to be provided to the priest for the offering of a πελανός: on this type of offering, no doubt a tangible offering here, either a cake or a type of libation, see CGRN 29 (Delphi), lines 24-28, and CGRN 94 (Eleusis), col. B, line 8. Three types of offering are distinguished in the cult of Heracles, qualified by the verb κατάρχομαι (line 31). Taken literally, this verb means "to make first-offerings from" and refers to preliminary sacrificial actions such as sprinkling water or grains or other substances, among other options. More generally, the term may have expressed the notion of "sacrificing", cp. CGRN 57 (Aixone), line 32. For the type of offering called δαρτός, a flayed animal, see here CGRN 26, lines B2-3; for animals with their skins "singed" (εὑστόν), see here again CGRN 57 (Aixone), lines 6 and 12. In the case of oxen being offered to Heracles, the priest received abundant perquisites: 9 portions of beef (for the technical term σάρξ for this meat, see here CGRN 61, Athens, line 4), as well as the very valuable hide of the animal (for prices of ox hides in fourth-century Athens, cf. the Dermatikon accounts, IG II² 1496). Lines 34-39: The priest of Eurysakes (by contrast with the priest of Heracles, see immediately above) was much more modestly compensated: he received only 6 dr. as his stipend—a more standard fare—as well as a compensation of 13 dr. for the leg and skin of an animal offered in the Eurysakeion (presumably the pig mentioned further below in line 88 or similar animals). It remains unclear why the priest was to be compensated for the loss of perquisites from this sacrifice. Van Straten (p. 158 n. 144) thought of a holocaust, but Ekroth (p. 134) has rightly observed that the sacrifice to Ioleos (lines 85) is explicitly qualified as ὁλόκαυτος. Ferguson (p. 42) instead thought that the rule concerned private sacrifices, where the individuals or other priests would officiate, and thus the priest of Eurysakes only received monetary compensation. Ekroth further observes that it would be strange for the priest to be compensated for the loss of a hide from the sacrifice in line 88, since that concerns a pig, whose skin would be singed, not flayed. Beyond this, the priest of Eurysakes was also responsible for the cult of the "Hero at the Salt-Works", as mentioned in lines 52-54. It is written here that he receives a leg and skin from what is sacrificed to this Hero. The only sacrifice to this figure that is mentioned in the sacrificial calendar is a sheep in Mounichion (cf. line 86). The dual duty of the priest may explain why he is also to receive a sum (7 dr., or more than double that of the priest of Heracles), εἰς πελανὸν ἀμφοτέρωσε. Was this, in other words, for the offering of a pelanos "for both gods"? The expression could alternatively have referred to the offering of a pelanos for both subgroups of Salaminioi, but this less likely option would raise the question of why such a double offering was apparently not made by the priest of Heracles. Lines 39-47: The text continues the question of priestly remuneration by adding other, more general clauses on the subject. In addition to the portions mentioned for the priests of Heracles and Eurysakes mentioned above, a portion of the meat that was divided in equal parts was to be given by both groups during any sacrifice, to whichever priest was responsible (lines 39-41). The passage then goes on to describe the rite of the "breads for (Athena) at Skiras" (lines 41-47); these rites were probably also connected with the Oschophoria (see above, lines 19-27). In this capacity, several other officials of the group, such as the herald, as well as other participants are mentioned. Particularly intriguing here are the κώπαι: the word literally designates an oar, and the reference here is thus usually thought to be to "rowers": cf. Rhodes - Osborne, following Lambert (p. 102-103; for the metonymy "oar" = "rower", cf. LSJ s.v.). An alternative interpretation was given by Parker (2005a: 215), who thinks of the olive-branch used during the Daphnephoria (in Thebes) and thus of a group of female participants here, who may have carried oars or large branches. It remains difficult to decide between a naval connection (cf. again the link to Theseus of the Oschophoria, and see below for his shipmates) or for a more direct connection with the grape-vine carrying ὀσχοφόροι. The priestesses of Athena and of Aglauros, Pandrosos and Kourotrophos receive one equal portion and a loaf of bread, but note that no further provisions for any perquisites from the genos are specified for them. Perhaps they received some perquisites from the city (as was hypothesized by Ferguson and followed by Parker 1996: 312). Lines 56-67: As part of the excerpt of a decree appended to the agreement of the Salaminioi, a few further but rather miscellaneous precisions are added here. A preliminary sacrifice (πρόθυμα) of the contest (ἅμιλλος) is notably mentioned; again, the concern here is to repartition the meat and valuable hides equally among the two constituent bodies. The contest will have been one of boys or young men, again in relation to the Oschophoria (see above, lines 19-27). On preliminary sacrifices, see here e.g. CGRN 46 (Piraeus). Another precision confirms that the office of herald of the group is to be held by a certain Thrasykles, presumably himself a member of the Hepta Phylai. Did this confirm the lifetime tenure of the office for a single individual or confer the office to Thrasykles and his descendants in perpetuity? The former option seems more plausible given the modality of election by lot specified above (lines 6-16) and a lack of explicit inclusion of Thrasykles’ descendants in the regulation. Lines 69-79: A ceremony in which prominent members of the genos had sworn a solemn oath to uphold the terms agreed on in the arbitration had apparently taken place; the names of oath-takers from both groups are recorded. For a comparable ceremony, cf. here CGRN 206 (Pergamon), lines 27-33, where the oath-taking is planned. Lines 85-88 (Mounychion): This first major entry of the calendar is concerned with a series of rites taking place at Porthmos: this was almost certainly a longstanding festival of Heracles in this sanctuary (for the idea of Herakleia at Porthmos, see Kearns). The date is not explicitly stated, but was no doubt obvious to the Salaminioi and apparently marked the first annual occasion on which they gathered. Given the mention of the date of 18 Mounychion below, lines 88-89, the festival will probably have fallen in the first half of the month. One good possibility for an identification of the date is 4 Mounychion, on which we know that the Herakleidai were also honoured at Erchia, CGRN 52, col. Β, lines 41-45; however, the dating of a festival of Heracles in Mounychion may well have varied in different local communities across Attica. Appropriately, Heracles receives the most significant offering. Apart from Alkmene his mother and Ioleos (sometimes Iolaus), his nephew and charioteer, not all the gods and heroes mentioned here have an obvious connection with Heracles, however, and it is not necessarily the case that all of the sacrifices for them fell on the same date. Ioleos receives a holocaust; for another sacrifice to this hero, cp. here CGRN 56 (Marathonian Tetrapolis), col. II, line 15 (Gamelion). The goddess Maia is usually known as the the mother of Hermes and so her presence in this list has caused some surprise; one hypothesis may be that we should not read the proper name but the word μαῖα, meaning "nurse", so that we have here the "Nurse" of Heracles (Parker, p. 314 interprets the line in this way and Lambert ad loc. considers this, but prefers to keep the matter open). Other heroes are apparently still more local, for instance a Hero at Antisara (an unknown toponym in Attica), about which nothing is known, and a Hero "at the tower" (Epipyrgidios is well-attested as an epithet, cf. Artemis Epipyrgidia at Eleusis, IG II² 5050; SEG 30, 93, lines 10-11; cp. Hekate with the same name, Paus. 2.30.2). A biennial sacrifice to Ion was also offered. This may have been a festival of its own, rather than being a part of the Herakleia, but we cannot be sure. Ion was one of the principal Attic heroes; in CGRN 26, lines A13, his father Xouthos appears among the reicipients of offerings of a trittys. Finally, prices for wood are listed and there is also a mention of sacrifices that the city offers "from the κύρβεις"; for the κύρβεις as an ancient (Archaic) source of authority for the Athenian ritual calendar, see esp. here CGRN 45. Line 88 (18 Mounychion): This occasion presents a single offering to Eurysakes, presumably in the sanctuary of the Eurysakeion. Given that it takes place at an explicitly different time and different place from the other rites above (lines 85-88), any direct connection with the festival of Heracles is probably to be excluded. There is little other contemporary evidence for this date (cf. Mikalson, p. 144-145). Lines 88-89 (28 Hekatombaion): This entry in the calendar attests to the participation of the Salaminioi in the Panathenaia in Athens, contributing a pig (or perhaps a sow?) to the procession and the wider civic sacrifice in the city. For the annual Panathenaia, see esp. here CGRN 92, and CGRN 19, line A19, for the participation of the deme of Skambonidai in this festival. Lines 89-90 (7 Metageitnion): The sacrifice for Apollo Patroos, Leto, Artemis and Athena Agela(i)a held on this day may be linked with the Metageitnia, a state festival for Apollo about which little is known (see Parker 2005a: 475). This hypothesis by Mikalson (p. 36) remains speculative, but one supporting is the fact that this festival ought to mean something like "changing neighbours" and that Plut. Mor. 601b recounts an aitiology of the festival as commemorating a legendary migration of the Athenians from the deme of Melite (with which the Salaminioi had a demonstrable link, viz. the Eurysakeion at Kolonos Agoraios in this deme) to Diomeia. For the prevalence of rites in honour of Apollo on the seventh day of the month, see CGRN 52 (Erchia), col. Α, lines 24-37 + col. Γ, lines 32-38 + col. Ε, lines 32-47 (on 7-8 Gamelion). Athena Agela(i)a has a very ancient epithet, attested already in H. Il. 5.765 (etc.) and Od. 3.378, though seldom except here in historical sources. On the meaning of this epithet, cf. the discussion in Parker 1996: 314. Lines 90-92 (Boedromion): This entry preserves a series of undated rites for Poseidon Hippodromios and several heroes during the month. The month of Boedromion contained many different rites and major festivals, such as the Eleusinian mysteries (see Mikalson), and it is not clear when to place the rituals here. A tentative date for the rituals here might perhaps be with 2 Boedromion (cf. Mikalson, p. 47), the mythical anniversary of the victory of Athena over her rival Poseidon. Alternatively, the event described here may have occurred later in the month, almost as a prelude to the rites for Theseus on 6 Pyanopsion (see below). The sanctuary of Poseidon Hippodromios was at Phaleron (probably at or near the Hippodrome at Echelidai), much like that of Athena Skiras. Phaiax and Nauseiros, both Salaminian heroes, formed a part of the crew of Theseus during his travels (pilot and look-out), according to the historian of Athens Philochoros (cited in Plut. Theseus 17.6). Teucer is a famous mythological figure, son of King Telamon of Salamis and thus perfectly appropriate as a figure in the cultic sphere of the Salaminioi; as a heroic figure, however, he is otherwise seldom mentioned. Lines 92-93 (6 + X Pyanopsion): The principal rites of the group for the hero Theseus fell on 6 Pyanopsion. This led Ferguson to date the Oschophoria to this day, an assumption which is widely questioned today; cf. esp. Mikalson, p. 67-69, with extensive discussion and expressing skepticism that this single sacrifice to Theseus does not necessarily correspond to the whole festival. By contrast, the Athenian civic Theseia, a larger sacrifice, took place on 8 Pyanopsion (see Mikalson, p.70-71; the eighth day of a given month was often devoted to rites for Poseidon and Theseus). It remains unclear how to resolve these issues. The other occasion mentioned in this month is the Apatouria, with the offering of a pig for Zeus Phratrios. The date for this sacrifice has not been established, but it must have occurred after 6 Pyanopsion and lasted over the course of 3-4 days (see Mikalson, p. 79, and Parker 2005a: 458-461, with a more extensive discussion). This was the festival held around the introduction of new members into phratries, and especially in honour of this eponymous god; for sacrifices to Zeus Phratrios, cf. here esp. CGRN 74 (phratry of the Demotionidai). Since this festival was celebrated by each phratry individually at its own place of worship, the regulation here would imply that the Salaminioi all belonged to one phratry. For further discussion of this possibility, cf. Parker 1996: 316. Line 93 (Maimakterion): The month Maimakterion is no doubt one of the least well-known in the Attic calendar (in fact, only one festival, the Pompaia, is attested during it; see Mikalson p.86). Remarkably, it concludes the cultic year for the Salaminioi, since we have here an imprecisely dated occasion for Athena Skiras, who receives the distinctive offering of a pregnant sheep (usually an offering with agricultural connotation, for Demeter or Ge, cp. here e.g. CGRN 56, Marathonian Tetrapolis, col. II, line 9). On the sacrifice of pregnant animals to Athena, see Georgoudi. The Hero Skiros is also honoured alongside the goddess. The figure is again known from Plutarch (Theseus 17.6 citing the Atthidographer Philochoros) as one who supplied Theseus with two men (Nausithoos and Phaiax; on the latter, see also above lines 90-92), when he sailed to Crete for fight the Minotaur. In Phaleron, a sanctuary of Skiros was located not far from that of the other two figures (Paus. 1.36.4, who also mentions a Skiros as mantis at Dodona). CGRN 84, l. x-x (http://cgrn.philo.ulg.ac.be/file/84/). <p>Cf. also: <bibl type="abbr" n="SEG">SEG</bibl> 21, 527; Sokolowski <bibl type="abbr" n="LSS">LSS</bibl> 19; Rhodes - Osborne <bibl type="abbr" n="GHI">GHI</bibl> 37; <ref target="https://www.atticinscriptions.com/inscription/LambertSalaminioi/1" type="external">AIO</ref>, with another English translation and commentary. <name type="deity" key="Hero"><w lemma="ἥρως">ἥρωι</w></name> <name type="deity" key="Nauseiros"><w lemma="Ναύσειρος">Ναυσείρωι</w></name> <name type="animal" key="swine"><name type="age"><w lemma="χοῖρος">χοῖρον</w></name></name> U+10142U+10142U+10142<unclear>ΙΙ</unclear><supplied reason="lost">Ι</supplied>. <lb xml:id="line_94" n="94"/><w lemma="κεφάλαιος">κεφάλαιον</w> οὗ <w lemma="δέω">δεῖ</w> <w lemma="ἀναλίσκω">ἀναλίσκειν</w> <w lemma="ἀμφότερος">ἀμφοτέρος</w> <w lemma="εἰς">ἐς</w> <w lemma="ἅπας">ἅπαντα</w> τὰ <name type="genericOffering"><w lemma="ἱερός">ἱερὰ</w></name> <num value="533">U+10145ΔΔΔ<unclear>ΙΙΙ</unclear></num>.